Syracuse, NY averages 28.25 degrees F in winter. You need a well-insulated garage door to keep the heat inside and the cold out. There's no better way to understand the quality of our products than to watch them being tested against others in a lab. Your door is only as good as its installation. That’s why GARAGA offers its customers a network of certified installers. From Cortland, NY to Owego, NY to Guilford, NY, you can benefit from over 40 years of combined experience with GARAGA products. 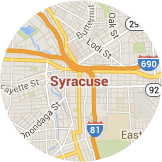 What other customers from Syracuse area say about Garaga? PERFECT job. Entire staff (family) is knowledgeable and courteous. A pleasure to have them working on our house. Nice people. Family owned business. Professional install crew. Excellent work. Great prices! You are helpful, professional, timely, a local family owned business that is selling a great product. Why are Garaga doors the most recommended in Syracuse? 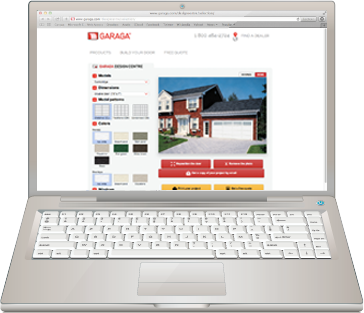 When it comes to garage doors, GARAGA garage door experts in Syracuse, NY have a lot of know-how. They also have an appreciation for the area’s weather patterns, as well as the architectural aspects of building construction in the region. Because of this, you will get the best advice tailored to your individual needs and preferences, while maintaining the region’s unique character. Trust the experts when buying a residential garage door. They will ensure that you have carefully considered the necessary aspects before you buy. For starters, a key piece of information is to determine how you use your garage as well as its location on your property. After that, the next consideration is how much insulation will be needed, what model of door opener you need, and which accessories should be installed. There are also decisions to be made around the choice of decorative elements like the model, color, texture, windows and hardware. 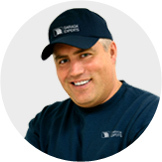 Why is LiftMaster the most well-known garage door opener brand in Syracuse, NY? LiftMaster is the top brand offering the greatest variety of garage door openers. 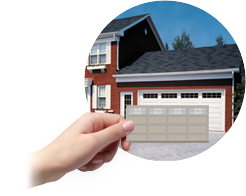 Garage door experts in greater Syracuse rely on them for many reasons. LiftMaster, a part of The Chamberlain Group, is a company with a longstanding reputation in this field. They expertly construct high quality, reliable products. Garage door professionals will tell you that LiftMaster garage door openers are made to last. LiftMaster door openers are simple to operate and customizable to each person’s unique needs. For instance, a quieter model is the best choice when there is a bedroom above the garage. There are a variety of models to operate all types of doors. LiftMaster also provides a wide selection of accessories to help you safely use your garage door. Qualified technicians can install your garage door and inspect it on a regular basis to ensure that your garage door system is kept in tip-top condition. This improves your door’s efficiency, durability and safety. The experts in the Syracuse, NY area work tirelessly to install, maintain and repair residential and commercial garage doors. Prevent emergencies and avoid unnecessary expenses by participating in our annual preventive maintenance program. Our teams will conduct an inspection and see to it that your garage door system is always kept in ideal working condition! Follow I‑81 S to S West St in Cortland County. Continue on I‑81 S to Owego.